Take a look at this... Plateau Central Haiti - The road from Hinche to Maissade was already in bad shape, now it's even worse due to recent rainfall early May 2018. 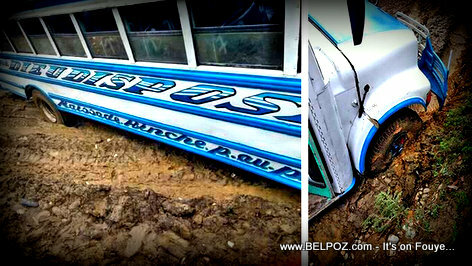 A school bus turned passenger transport that carring passengers from Maissade to Port-au-Prince is seen here stuck in the mud. Note: President Jovenel moise promises that this road will be paved with a bridge on river Rio Frio river that always leave Maissade residents in limbo, cutting off Maissade with Hinche and Port-au-Prince during the season. « Haiti Road Construction - President Jovenel says: TPTC was on its knees when I became president, BUT Not Anymore! If it can make you feel good, you must know you're not alone.The french people is the laziest, most stupid and antisemitic in the world.Even at my age, i am considering leaving for good. There are no roads in the mountains. I've been in Haiti for 34 years and built and rebuilt a road from Rt. 1 in Cabaret to the villages we work with. The government has allowed our road to be used to build housing but no one contributes to the upkeep of the road. In one year it was destroyed by the MAC trucks. I have an off road vehicle so I can manage but the people are cut of from medical services, water, food in emergencies.